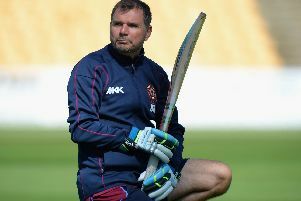 David Ripley says Northants Steelbacks’ remarkable victory over Worcestershire Rapids created a special feeling in the dressing room. The Steelbacks managed to defend 126 to earn a sensational 21-run Royal London One-Day Cup win at New Road. Joe Leach took a hat-trick with the first three balls of the Northants innings, and they slipped to 19 for six before eventually recovering slightly to post a total that looked well below par. But it proved to be a winning score after a fantastic bowling performance, with Muhammad Azharullah the star as he claimed four for 22. Rory Kleinveldt and Olly Stone also chipped in with two apiece as the hosts were bowled out for 105. And although Ripley admitted his side’s batting wasn’t good enough, the head coach praised their excellence in the field to pull off the most unlikely of wins. “It was a fantastic win from that position,” Ripley said. “That’s up there with one of the more unusual games, hat-trick first three balls and obviously we only get 126 and your first reaction is ‘that’s not good enough’. “We’ve not batted well and we’ve not batted well all competition, and no one’s happy about that, but it’s that competitive spirit and it was really clear to see having pulled that game out of the fire how much it meant to everybody. That was really special. “He (Azharullah) did what he does well, line and length with good pace and a little bit of movement. It asked questions of the batsmen, it was a great effort and those wickets before lunch (Worcestershire were 29 for four before the interval) gave us a good buzz. “We got that little bit of belief that we could win and put a little bit of doubt into Worcester so it was important we started well. The win was the Steelbacks’ second in five group stage matches, and keeps alive their hopes of qualification for the quarter-finals. The games come thick and fast, with Somerset the visitors to the County Ground tomorrow (Monday) afternoon, and Ripley knows another win would leave his side’s destiny in their own hands going into the final two games in two weeks’ time. “We have started poorly and slowly so we can’t afford many bad days, but if we play well tomorrow and we win that game we’re in with a chance, and you just start to look at the table then and work out what we might need.